Ok, I know that I’m not re-inventing the wheel here. 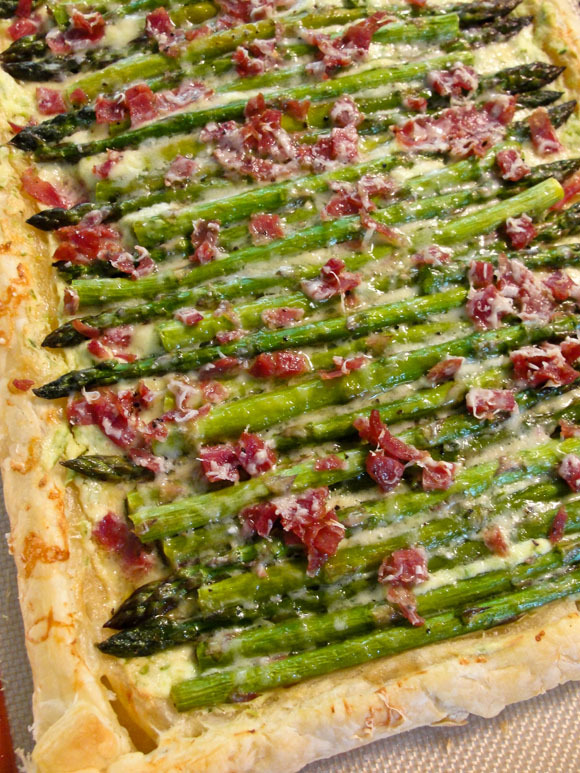 If you Google Asparagus tart, you will probably get a gazillion hits on recipes – because there is A LOT of ways to eat asparagus. So, why not contribute one more to the bunch. See? I was all over the place, when I finished my counter looked like I was cleaning my refrigerator instead of making a simple Asparagus tart. Yeah, it was a scattered grab-everything you can moment. I’m surprise that it worked. I wanted the asparagus to be cooked, but “al dente”, so I opted by blanching them and then afterwards, just sautéing them over a bit of olive oil and the cooked Sopresata. 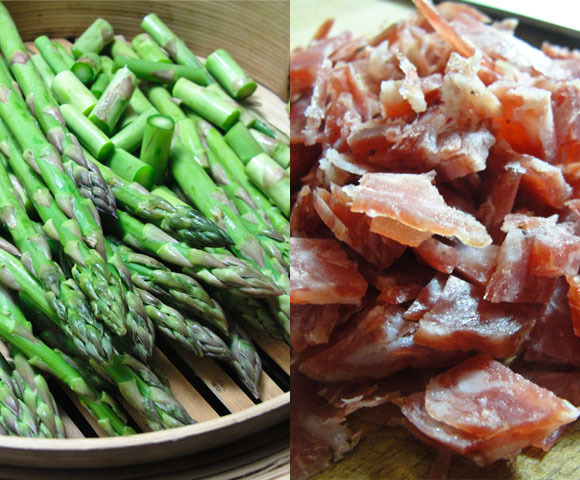 If you don’t have Sopresata, you could use any kind of salami, or even ham, the point was to have something to give it a bit of robustness and not be just the asparagus. If you want to make this a vegetarian dish – just opt it out. I also wanted to have the asparagus over something creamy. So, I decided to use the ricotta to make a puree with the asparagus stalks and a mixture of cheeses - because well Ricotta is bland, so it does need a kick in the pants to make it shine. It came out delicious, perfect for a quick lunch or a side to a heavier meal. Even as a great appetizer, especially if you go all out and make individual square tarts, instead of a long rectangular. So many choices! So little… Never mind, here is the recipe. It may look like a lot of steps, but it’s pretty easy to put together. 1 lb of fresh asparagus, medium size is always best, trimmed the bottoms off. Preheat oven to 400F. Roll out pastry on floured surface to about 13x10 inch rectangle (does not need to be pretty), place on a baking sheet. Fold your edges towards the cetner of your rectangle to create a half inch wide strip from al four sides. Brush the inside of the folded strips with some of the beaten egg, then press the strips, egg side down, to adhere, forming raised border. Brush border with egg; reserve remaining beaten egg. Place in the refrigerator to chill while preparing the puree. Steam asparagus just until crips tender, about 3 minutes. Transfer to bowl full of ice water to stop the cooking process and to cool. Drain and pat dry with kitchen towel. Cut off top 2 to 3 inches of asparagus tops and set aside. Reserved the stalks, we will be using them for the puree. In a sauté pan over medium heat, warm up 2 tablespoon of olive oil. Add the reserved asparagus stalks and mix until coated with oil and cook for about 2-3 minutes, season with salt and pepper. Remove from pan and place in a food processor. Go back to the pan and add another tablespoon of oil. When heated, add the Soppressata and sautéed for about 1-2 minute once done with a spoon remove about half of the cooked salami and place in bowl with the previously reserved cheese. Add the rest of the asparagus tops and sauté fro 1-2 minutes, season with salt and pepper and squeeze about ½ a lemon juice on top, turn off heat and let it sit while making the puree. Coarsely puree the cooked asparagus stalks in processor by pulsing 2-4 times. Add the remaining beaten egg, ricotta, and a dash of salt and pepper. Process until a thick puree forms. Transfer to bowl with the salami and cheese and mix until everything is creamy and incorporated. Take a taste, and if needed, season with salt and pepper. Take chill dough out of refrigerator and spread the puree mixture evenly over the pastry. Sprinkle with some of the reserved cheese mixture (don’t use all). Arrange the asparagus tips over filling and once more sprinkle with the rest of the cheese.